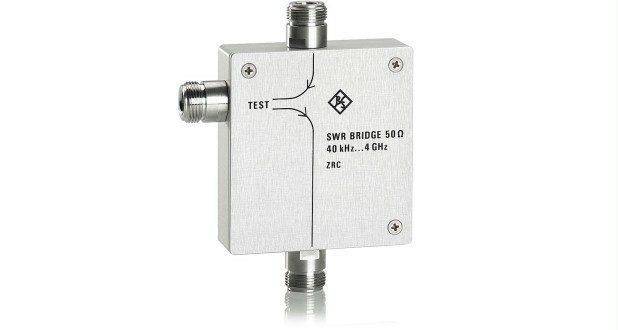 The SWR Bridge R&S®ZRC is used to measure the magnitude and phase of the reflection coefficient of RF circuits and components such as filters, amplifiers, mixers and antennas. The output signal from the test generator is applied to the DUT via the SWR bridge. The SWR Bridge R&S®ZRC is used to measure the magnitude and phase of the reflection coefficient of RF circuits and components such as filters, amplifiers, mixers and antennas. The output signal from the test generator is applied to the DUT via the SWR bridge. Depending on the reflection coefficient r of the DUT, part of the signal is reflected to the bridge and then routed to the receiver, where it is detected and displayed. A shopen (short circuit/open circuit) and a match that can be used for calibration and verification of nominal data are part of the equipment supplied. A connector adapter that can directly connect the bridge to a test generator without the use of cables is also supplied.